View topic - What About the Alicorns? Okay, so we know there are now four alicorns (Celestia, Luna, Cadance, and Twilight). But there have been some references and alicorn sightings that have raised many questions in my mind. Prince Blueblood has been referred to as Celestia's nephew... Luna had been in the moon for 1000 years so he couldn't be hers, and Cadance wasn't married yet (and doesn't seem like the type of pony to commit adultery). So... who is his mother and father (and what are their respective species)? Princess Cadance is apparently Celestia's adopted niece... so who is Cadance's adoptive mother and where did Cadance herself come from? Then- who is this Leon kid? Celestia's cousin, according to the text on the magazine... so who are his parents? 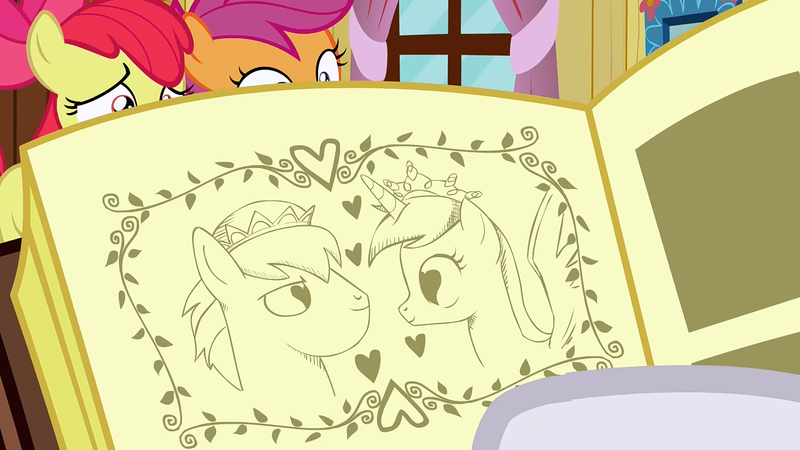 Are they both alicorns (implying a second male alicorn)? In Hearts and Hooves, day, a book talks about a stallion who gave a princess the love poison and the kingdom fell into ruin. Who was this princess? Now, there are questions about how alicorns are created, and how they grow, and their other properties. Where did the first alicorns come from? Can alicorns be born, or must they be created by magic? Can we, as a community, solve the enigma of the Alicorns??!! Re: What About the Alicorns? There's a character in the chat currently working on this mystery. The toyline and storybooks may or may not have any sort of continuity with the TV series, so the little colt alicorn is technically non-canon for the show until he appears on it. In the meta-sense, Blueblood is Celestia's nephew because of the trope of the Chaste Toon. Execs in charge of the show didn't want Celesteia to be a mother or married, so Blueblood couldn't be her son. He had to be some sort of relative. As far as the show goes, that's the only explanation that's required, but for our purposes, we can only assume that there is some sort of non-alicorn ruling class. Twilight Sparkle 'ascending' to alicorn status does lend some support to the idea that alicorns are just special cases. As far a the one in Hearts and Hooves Day... my personal head-canon is that the alicorn pictured there was a young Celestia. Here's something I've been wondering, and it's in regards to alicorn manes. Celestia and Luna have been depicted as having ethereal manes of a sort, though Luna did have normal hair in her initial appearance. So I wonder, are ethereal manes something all alicorns have, and if so, why don't Cadance and Twilight have them yet? Or could it be they're a trait exclusive to the Royal Sisters? LennonFan wrote: Here's something I've been wondering, and it's in regards to alicorn manes. Celestia and Luna have been depicted as having ethereal manes of a sort, though Luna did have normal hair in her initial appearance. So I wonder, are ethereal manes something all alicorns have, and if so, why don't Cadance and Twilight have them yet? Or could it be they're a trait exclusive to the Royal Sisters? My guess is that it has to do with their necklace/collar things. Luna did not have one when she was first shown in the premire. Cadance and Twilight don't have the chest plates. In the beginning of the very first episode, the two alicorns didn't have chestplates and had normal manes. aspirations wrote: My guess is that it has to do with their necklace/collar things. That is a lot more likely than mine. My thought had been that the necklaces were somehow enchanted, but the "full power" thing makes a lot more sense. Does that mean, then, that Cadance and Twilight might eventually have the flowy manes? Last edited by aspirations on Thu Apr 11, 2013 12:07 pm, edited 1 time in total. aspirations wrote: That is a lot more likely than mine. My thought had been that the necklaces were somehow enchanted, but the "full power" thing makes a lot more sense. Does that mean, then, that Cadance and Twioight might eventually have the flowy manes? Entirely possible. We'll have to wait and see. How were the first alicorns made? When Equestria was founded, all of the ponies began to cooperate and exist in harmony together. The Wyndigos summoned by the fighting had gone and the ponies were prospering in this new land of plenty. Little did they know that a much different creature had been drawn to Equestria by their fighting and disharmony... one that would wreak havoc on their world. This creature had a lion paw, an eagle claw, a snake tail, and a dragon's wing. This creature had the head of a pony and a body of all sorts of creatures. This creature was a mischevious creature of chaos, a draconequs named Discord. Discord quickly turned Equestria topsy-turvy (literally, in some cases). He seized control without warning, and the chaos he created gave him more and more power until he was practically drunk on it. In his fit of arrogance, he tried to engineer more chaos than ever by creating a species of pony that was more powerful than any other before them. These ponies were not one species with specific powers and attributes, but a mash up of all three types into a creature of immense power. These were the alicorns. The world they grew up in was Discord's land, a dark world of confusion and discord. But one powerful unicorn (and possibly his apprentice) worked underground to stop their Chaos King. StarSwirl the Bearded and Smart Cookie found the incredibly powerful alicorns and, using a combination of the unicorns' smarts and the powerful magic of the alicorns, created six objects of incredible power to destroy Discord. These objects were called the Elements of Harmony, and the alicorns used them to trap Discord in stone. We now know as of the end of Season 3 that it's possible for a unicorn to be 'promoted' to an alicorn. Of course, we don't know if that was intentional by the writers, but in all likelihood it was not intentional. We can speculate and add 2+2 all we want, but the odds are the answer isn't the 4 we fans are expecting. I believe that Twilight and Cadence are not the only other alicorns but of course we have no canon proof. I guess we'll find out this next season! I feel like this Princess is Chrysalis, or an ancient Changeling. I feel this way because of the "love poison=ruined kingdom" could relate to the love feeding, living in hive changelings. But that's just my theory. Well, I know that Twilight and Cadence are artificial Alicorns, so they are not immortal, and in the show it clearly shows Cadence aging, I have had some people ask if Twilight was a secret alicorn, and the answer is no, Celestia simply turned Twilight into one, So the princess under the spell can't be Luna or Cadence, nor Twilight, So I would guess it was Celetia. And Prince BlueBlood could as well be adopted? Well we don't know to what extent Cadence or Twilight will age, as they might age to a certain point before stopping. As far as Blueblood is related, he is related, but incredibly distantly. Since I couldn't find a decent link. Hey, I still think all of the Mane Six will be Alicorn's by the end of it, or that they'll gain some form of immortality, but that's my head canon. I don't think that the whole main six would turn into alicorns or gain some form of immortality, I think because Twilight had so much magical power that Celestia turned into a alicorn because of it. Luna and Celestia are natural alicorns, but Cadence and Twilight are artificial, so, they won't live forever. Alicorns are indeed born, but they must come from an alicorn mother and a alicorn father to be full natural alicorns, Cadence I think was a pegasus before as well, and somepony turned her into a alicorn as well, Celestia and Luna both have alicorn parents https://tse3.mm.bing.net/th?id=HN.607987581863071364&pid=1.7 So...making them FULL alicorns. It is the most popular form the parents are in, but no one from Hasbro said anything about Celestia and Luna's parents, but my head canon guesses that they are full alicorns.